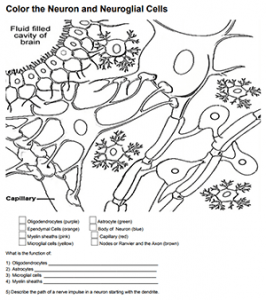 This coloring worksheet is intended for anatomy students who have already been introduced to neurons and neuroglial cells. 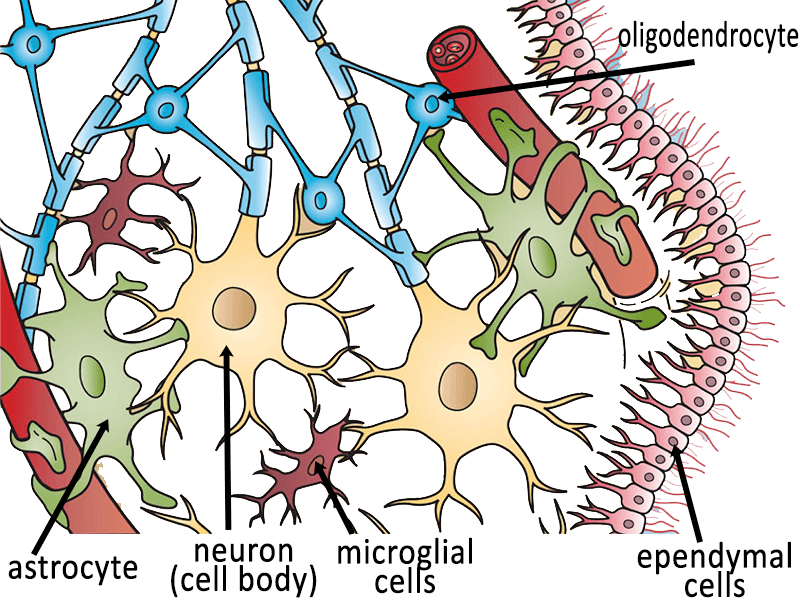 There are no instructions, students must identify each of the types of glial cells: oligodendrocytes, astrocytes, microglial cells, , and ependymal cells. They should use their textbook or other resources to identify the cells and color them according to the directions. They are also required to provide a brief description of the functions of each of the cells. Several images of the neuroglia can be found online to help students complete this assignment if there are no applicable images in their textbook. Students can also explore glial cells and their relationship to cancer. Glioblastoma is considered one of the deadliest of the brain cancers, making headline news when Senator John McCain was diagnosed. Students can read about this cancer at NPR Health News. Because glioblastoma tumors do not usually have a defined mass, they can be difficult to treat. The tumor itself can original from the astrocytes, oligodendrocytes and even from neural stem cells.